Garment manufacturing is a low-cost commodity business. Most of the value in the apparel industry comes from design, technology, sales, marketing, and distribution—not manufacturing. The successful players in apparel, such as Ralph Lauren and Nike (NKE), figured this out long ago. Because the economics are bad, most U.S. apparel manufacturing operations folded decades ago. Only 97,000 Americans still have jobs in apparel production, according to the U.S. Department of Labor, and most of them are making highly specialized products like DuPont (DD) Kevlar uniforms that cannot be made elsewhere. 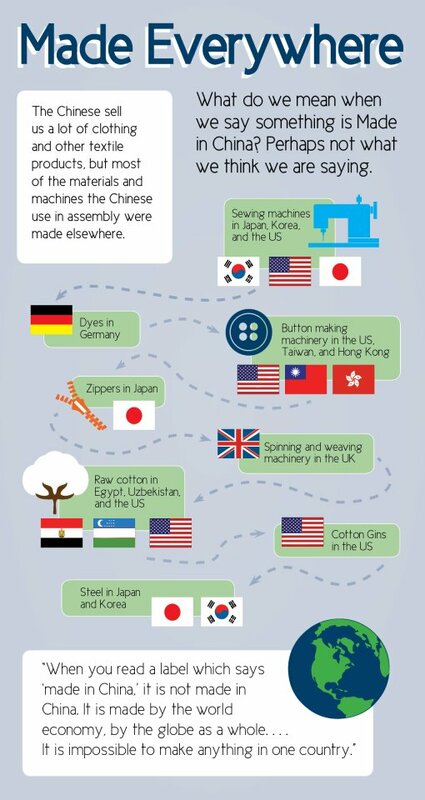 But just because America doesn’t manufacture apparel anymore doesn’t mean we can’t lead the industry. In fact, the world’s largest apparel companies are almost all U.S.-based, including Nike, VF (VFC), PVH (PVH), and Ralph Lauren, to name a few. These companies have grown a combined 146 percent during the past 10 years, adding more than $27 billion in revenue. Nike has created more than 15,000 new jobs in the U.S. during this time, Ralph Lauren almost 10,000. And unlike the low-paying production jobs next to sewing machines, these are well-paying jobs in marketing, accounting, design, and management. These companies are winning globally by out-designing, out-innovating, and out-marketing the competition. Nike, for example, is unveiling a new TurboSpeed running suit at the London Olympic Games that it claims can reduce 100-meter sprint times by .023 seconds. Nike’s gear will be used by teams from many countries, including Russia, China, and of course, the U.S.
What Nike and Ralph Lauren don’t do is make their own products, in the U.S. or elsewhere—and this has become their competitive advantage. Both companies source products from hundreds of independent manufacturers in more than 30 countries (less than 3 percent coming from the U.S.). The flexibility allows them to be cost-competitive globally. It also allows their design teams to focus on creating the most exciting new products possible without having to worry whether they can be made on a legacy production line. Not only is outsourcing good for business, but the future of the American economy is dependent upon it. In case you're wondering, it's basic economic facts like these that have Chinese politicians and commentators openly mocking protectionist US politicians like Sens. Harry Reid and Chuck Schumer for their latest Olympic hysteria. If only we could outsource them.